I read an interesting fact the other day that 1.4 billion people around the world send over 50 billion messages each day to communicate with one another. Facebook’s What’sApp and Messenger have around one billion monthly active users each and WeChat around 900 million. I encourage you to stop for a moment and think about the enormity of these numbers. They are staggering, and they are going to continue to grow. Messaging as a conversation and interaction interface has fundamentally shifted how we communicate with one another (when was the last time you called someone for a quick question? ), and it is about to shift how people communicate with your company. The format has taken off because it is inherently easy to use, is convenient, is contextual, and is expressive. Most importantly, it supports effortless customer service interactions. All one has to do is look for a brand’s name on a social network or messaging app and start communicating. There are many conflicting definitions of messaging, but at Sparkcentral, we define messaging as text-based messages sent from social media channels such as Twitter, Facebook, and Instagram, from messaging apps such as Messenger, WeChat, and WhatsApp to those from mobile devices such as SMS and in-app. Think of it as a conversation format that can be maintained across all of these mediums. 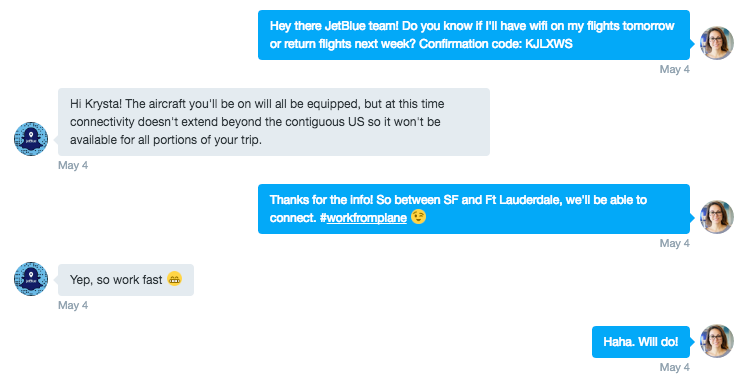 JetBlue uses Twitter’s Direct Message to message with customers regarding any service questions with humor and ease. Messaging is primed to become the new standard in customer service. Think about how you message your friends and family. You send an iMessage, SMS, Facebook, or What’sApp message, and go about your other business. When your friend responds, you get a notification on your home screen or in the app. The same applies to communicating with brands. In fact, nine out of 10 people would prefer to message a business because doing so is convenient and does not interrupt their day. Traditional support channels like phone, email, and chat put the burden of work on the customer to call or email and often force them to wait to get help. With messaging, customers get notified of your response and can respond accordingly. Unlike most customer service interactions today, such as phone and live chat, which are based on sessions, conversations can continue where they last left off. This means that customers don’t have to repeat themselves every time they reach out to a company. Research has found that customer service interactions that make the customer repeat information, reach out multiple times, and generally add hassle factors to the process are four times more likely to drive customer disloyalty. With messaging, both the consumer and the brand have a history of past interactions, which makes follow-ups easier and more convenient, reducing the effort required to resolve the issue on both sides. Companies that have adopted messaging as customer service channels achieve a 2.9 times greater annual increase in NPS compared to “All Others” (12.3 percent versus 4.3 percent). Additionally, research has found that employee engagement rates also increase as the format makes service agents jobs easier. People lead increasingly busy lives, and being held hostage by the phone or live chat doesn’t help in the matter. Some issues take time to solve, and instead of having to sit and wait while the rep troubleshoots, the customer can just go about their business. Companies can message the customer when there is news or they need additional information, which saves time and money on both sides. With email, you have no way of knowing if your problem is being dealt with, and most live chat sessions expire if your attention is diverted to other issues, forcing you to start all over again. Messaging as an interaction interface is built to support operational and transactional messages. Brands can send customers boarding passes, receipts, shipping notifications, and more via messaging apps and even more within their own apps. Customers can respond directly to those messages and get help without having to look up phone numbers and repeat themselves to another agent. Many companies are also leveraging structured messages (think flight delay notifications, shipping confirmations, etc.) and chatbots over messaging apps such as Messenger in order to provide customers with pertinent information in one convenient place. GIFs, emoji, images, and video can all be leveraged in messages making it an entirely more expressive medium than phone, email, or chat. Many critics of digital servicing argue that text-based formats remove the human element from exchanges, yet messaging has been built to enable people to share emotions and express themselves in fundamentally new ways. Emoji, in particular, have entered the mainstream with brands and people utilizing them to express humor, happiness, and even anger. Similarly, GIFs can be shared to express sarcasm and humor in a way that is often lacking on phone-based customer support. Customer service on messaging apps and interfaces works because it is a fundamentally familiar form of communication for most of the world’s population. To get started, I recommend that you begin by building your process and workflows to support digital care on the most commonly used social channels and messaging apps of today (Facebook, Twitter, Messenger, WeChat) and then moving from there towards owned (in-app, web) messaging channels. 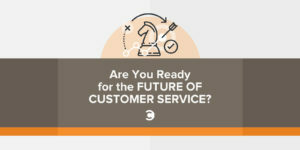 A recent report sponsored by Sparkcentral found that 41 percent of organizations surveyed currently use messaging as part of their channel mix for customer service conversations, and 15 percent of brands are considering adopting a messaging platform for customer service in the near future. Anaal Patel’s expertise in digital customer engagement and building brand loyalty stems from a decade of experience in the marketing, customer service, and technology space. As vice president of marketing for Sparkcentral, Anaal leads marketing and communication efforts for the leading social and customer engagement platform, which empowers clients such as Delta Air Lines, JetBlue Airways, Zappos, and Uber to deliver amazing customer service experiences. Anaal also loves to cook, read, travel, and talk about the weather.